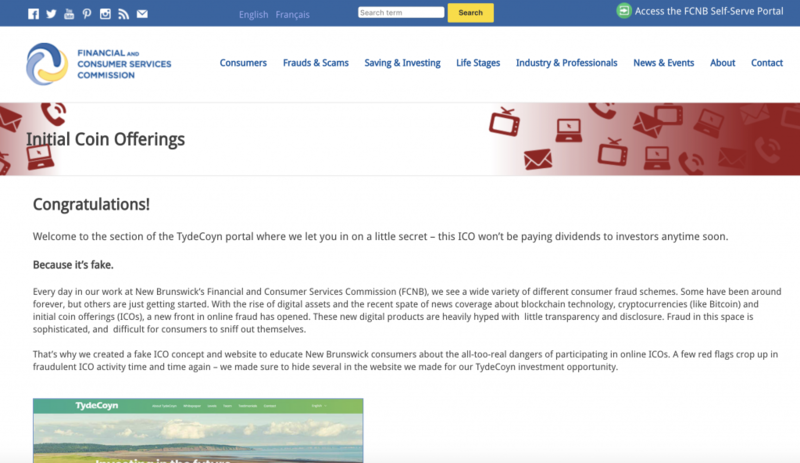 New Brunswick’s Financial and Consumer Services Commission (FCNB) has created a fake website and ICO in a bid to educate investors on the danger of cryptocurrency scams. “We’re using blockchain technology to create a better and more sustainable future for our waterways, our wildlife and our families. That’s the TydeCoyn mission,” said the YouTube description. Investors are promised “expected rates of return on each pre-ICO token at 85%, with that number expanding to 115%,” according to the Tydecoyn.ca site. The “red flags” included unsupported and impossible promises of guaranteed returns and offered limited transparency of the founding team and other supporters. ICO fraudsters “use fancy terminology and vague technical speech to lure consumers into a false sense of security, where they make it sound like the impossible is actually possible: no risk, all reward,” said the FCNB. The regulator warned against ICOs which don’t reveal clear contact information for founders and partners. Good investments should have two way information flows. Namely, investors should be able to easily raise questions and have them answered. “Serious companies need more than an IP address or a digital wallet address to do business with customers,” said the FCNB. The fake ICO also included a countdown clock. “If someone is trying to rush you into making an investment, odds are that their “opportunity” won’t hold up under increased scrutiny,” explained the FCNB. “Interested investors should not participate unless they are emotionally and financially able to assume the risk of losing their entire investment,” warned Erin King, FCNB’s Senior Education and Website Officer, speaking to Wealth Professional. The FCNB website points those either fooled by the website, or curious enough to find out more, to its investor education material. Credible cryptocurrency businesses and exchanges often also aim to educate investors without bias on how to examine opportunities.